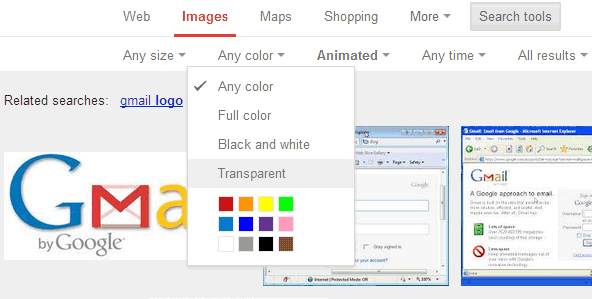 Google tests a new version of the advanced image search page that lets you restrict the results to transparent images and animated images. The most popular image file formats that support transparency are GIF and PNG, while most animated images are GIF files. Animated GIFs made a comeback and they're popular again. "Just as the LP has enjoyed a second spin among retro-minded music fans, animated GIFs — the choppy, crude snippets of video loops that hearken back to dial-up modems — are enjoying an unlikely vogue as the digital accessory of the moment," says the New York Times. Update: the feature is now available. Check the animated GIFs for [Gmail] and the transparent PNGs for [Nexus 7]. I see it's now available worldwide. Maybe you should detect Animated PNGs too. If acTL chunk is found before the first IDAT chunk, that .png is animated.